Turn on the TV, visit a web page, open a newspaper, and you’ll learn about another mass shooting, hate crime, terrorist attack, or weather-related disaster. While the types of threats may not have changed much, their methods and frequencies are increasing at an alarming rate. The old ways of communicating no longer suffice in today’s emergency environments. 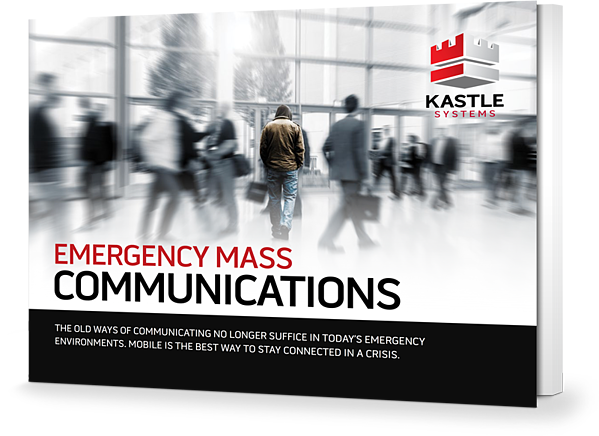 Complete the form to get your free eBook and learn why mobile emergency mass communications are the best way to stay connected in a crisis. Want to see KastleAlert in Action? Stop by STAR Booth #1083 at the BOMA Chicago Expo – October 10th, 2018 in Chicago, Illinois. Email info@kastle.com to set up your personal demonstration appointment.